Written in a metre that he himself devised, this lyric-narrative is one of his best-known works. From my own reading, what is most striking is his prolific and remarkable use of ಅಚ್ಚಗನ್ನಡ (non-Sanskritized Kannada) and its various poetic possibilities – most particularly those of assonance, compactness, rhyme, and alliteration. This verse is the very first of the forty-something verses that make up the lyric-narrative. As can be seen, it remains a poem in its own right while serving the purpose of a prologue. As usual, here is my recording of the Kannada original. The tune, if one is discrernible, is my own. Embroider the tangles into a dress? That flows like a stream both fresh and bright. When it hosts both joy and misery. In a raft or a boat or a catamaran. And drowning, sink to the home of pearls. The span of this bond that is binding us! A number of Da Ra Bendre’s poems are from the perspective of a woman. This particular poem expresses the despair of one such “heroine.” The poet has indicated that the poem sprung from looking at an old painting (of a gōpi who entranced by Krishna’s presence is oblivious to her surroundings and her gōpi-friends). As usual, here is a recording of my reciting (singing) the original Kannada poem. The tune, if one is discernible, is C. Ashwath’s. One of Da Ra Bendre’s more popular, accessible (and underappreciated) poems. My introduction to Bendre’s poetry was when I listened to the sung version of this poem, many years ago. In the intervening years, I have travelled the familiar yet unfamiliar terrain of the Kannada language in ways I had never anticipated. But that is a story for another day. For now, I will only say that the memory and the rediscovery of this poem sparked my relationship with Bendre’s poetry. In particular, the first two lines of stanza 3 (which read “ತ್ರೇತಾಯುಗ ರಾಮನ್ನ, ದ್ವಾಪರದ ಕೃಷ್ಣನ್ನ|ಕಲಿಯುಗದ ಕಲ್ಕೀನ ಕಂಡಾನ” in the original) and the untranslatable onomatopoeic refrain (“ತನ್ನsನ ತಾsನನ ತಂದಾsನ”) from line 2 of stanza 5 continue to draw me into their eddy of feeling. The poem itself was inspired by the poet waking up in a railway coach and “seeing” a large bear at the door. When he went out and looked, it had disappeared. He learned later that an accident had happened at the very station he had “seen” the bear, an accident in which a number of people had lost their lives. It was the poet’s belief that one of those people had appeared to him in the form of the bear seeking release for their ātma (soul). 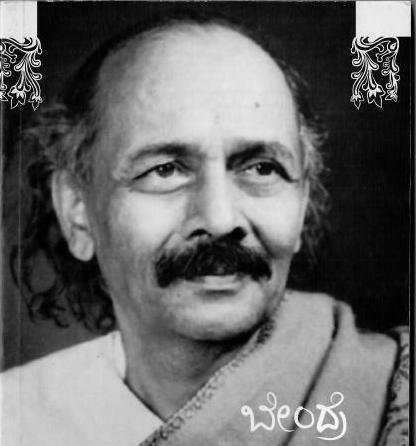 As usual, I’ve included my recording of the original Kannada poem. The sing-song rhythm is taken from B.R Chaya’s version, tuned by Gururaj Marpalli. Then he stood as the bear round him played. That lived contentedly on honey? The Silver and the Kali ages it had seen. On the jambu fruit by the river gleaned. Come ward off the evil eye. “Whát a lovely dance,” all say. Looking to the heavens with joined hands. This life: he hides behind and pulls the strings. As though such means will salvation bring. Prances,’ – so thinks the poet and his thinking shares. Poem Details: From the collection “ಸೂರ್ಯಪಾನ,” first published in 1956. Note: Like it often is, Sunaath Kaka’s Kannada explication of this poem on his website sallaap.blogspot.com was of great help during the translation. My thanks to him.